Today’s guest review is from reader Amanda. 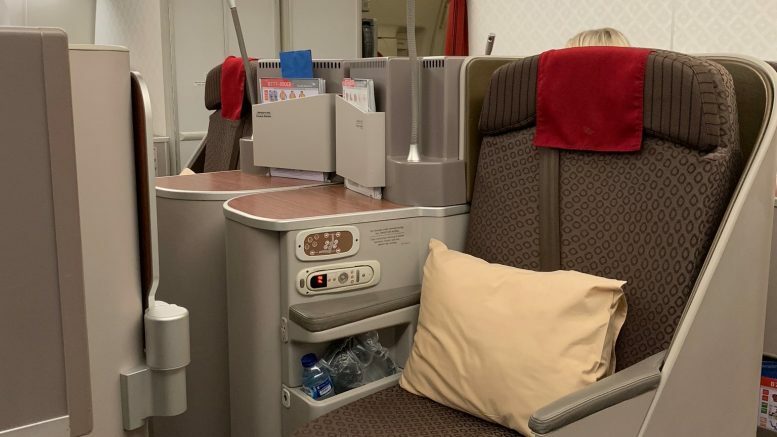 I have often written about Garuda who, despite once being on the European banned list, are now a decent airline that have won Skytrax awards for their cabin crew – World’s best cabin crew. 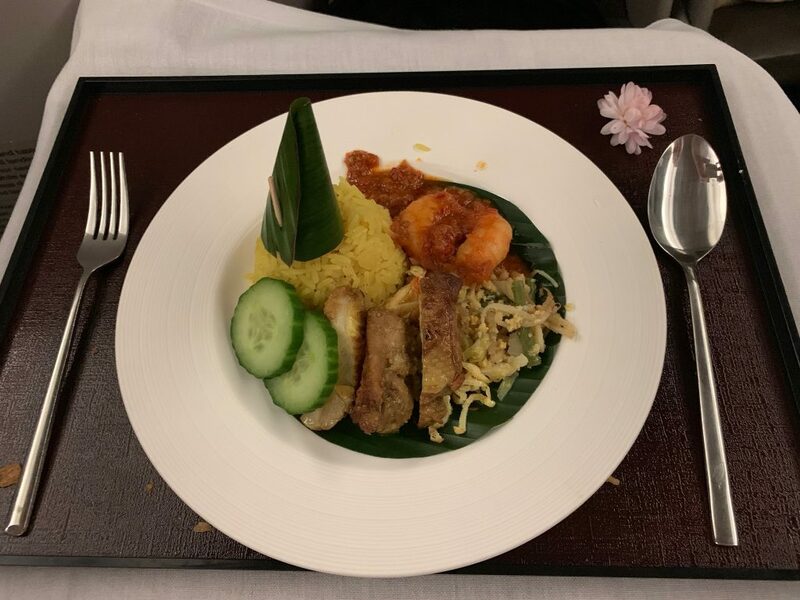 Back in February 2018 my partner and I were tempted by the bargain business class fare London to Bangkok on Garuda Indonesia. At £1085 per person return, these were a snip even if it meant getting to Thailand the long way round, via Jakarta. We booked tickets flying out of London Heathrow on Saturday 10th November, returning four weeks later. We credited our miles to KLM Flying Blue loyalty program as Garuda are part of Skyteam alliance. 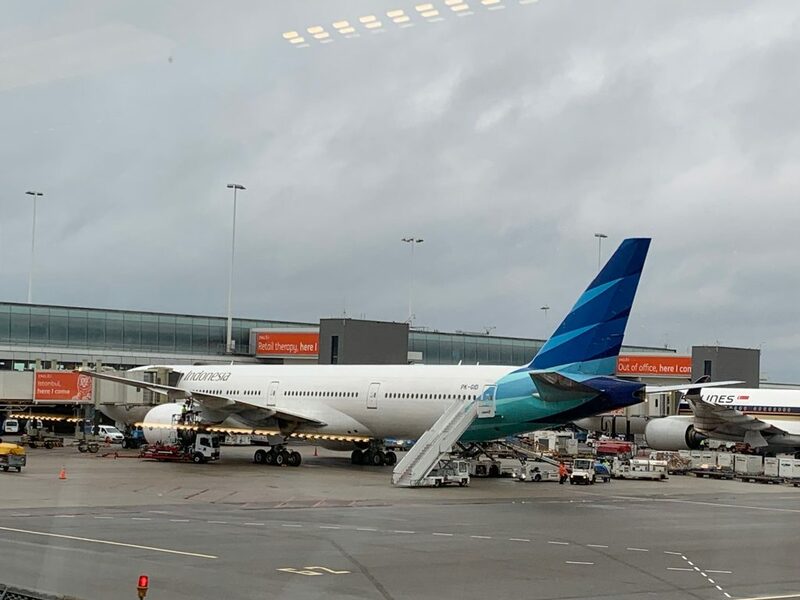 Knowing that Garuda partnered with KLM, we anticipated that we’d be flown from London to Amsterdam where we’d be able to pick up our Garuda flight to Bangkok. When the news was finally confirmed, (and incidentally this was not handled well) we contacted the call centre and after several attempts, miraculously got through. The person we spoke to was extremely helpful, but I’d armed myself with information of how we wanted to make the most of the changes. It also worked out better for us not to have to travel from London, so I was able to cancel our expensive parking at Heathrow and organise a quick taxi to our local airport instead. It was more convenient for us to fly KLM out of Birmingham to Amsterdam rather than London and Garuda were happy to make these changes. I’d already looked at the KLM schedule and decided which flights we’d prefer. As our main flight to Bangkok was now scheduled to leave at 9.30 am on the Saturday rather than during the evening, it meant getting to Amsterdam the day before to ensure we caught our flight. Time was not an issue for us, so we decided to enjoy an extra day’s holiday and see Amsterdam for the day. We booked a room at the Sheraton which is at the airport and was incredibly convenient. Finally, our holiday finally arrived and after a short taxi ride to Birmingham airport we checked in at the KLM Business class desk. 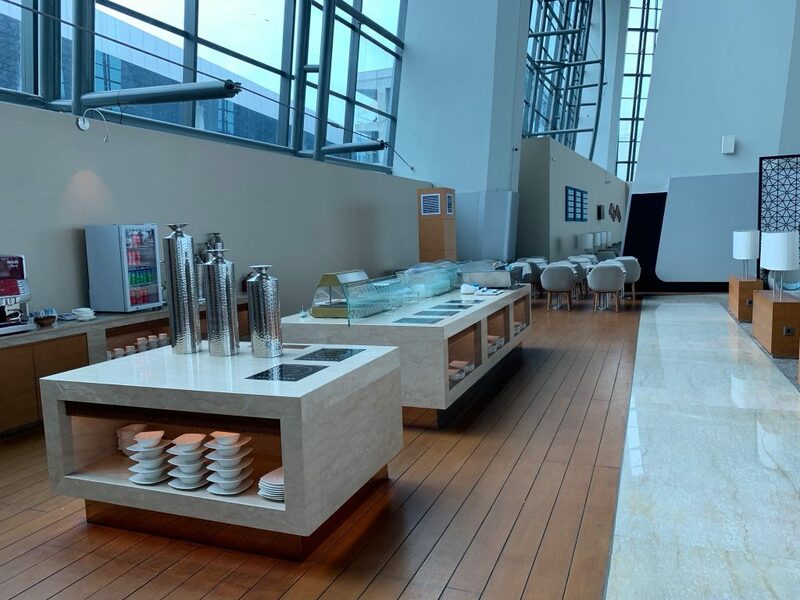 Although the airport was busy, there were no queues and in a matter of minutes, we were through security and settled in at the Aspire business lounge having a much needed coffee after our early morning start. The lounge was not very aspirational as a party of women were taking advantage of the free alcohol and were in high (noisy) spirits even at 7.30 am! I didn’t rate this lounge at all, apart from the hot and cold drinks, there was nothing really to eat unless you were into large floury bacon baps, Weetabix or oranges. Compared to the No1 Lounge nearby, this was very disappointing. Our KLM flight was on time and the flight attendant friendly and efficient. Seating was at the front of the plane in the first 3 rows with a 3-3 arrangement but with the middle seat left free. We were offered drinks and a surprisingly delicious breakfast of smoked salmon. 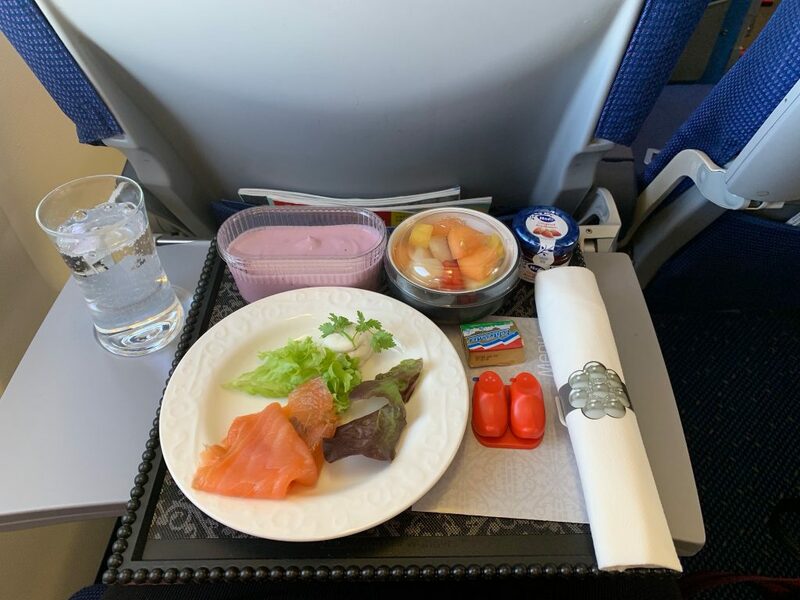 I was really impressed with the service, food and drink on such a short flight. I had expected to collect our bags in Amsterdam and check them in on Garuda the following day, (there were several people who had thought the same thing too). Unfortunately, this wasn’t the case, the bags had been automatically checked through to our next flight. We certainly weren’t prepared for an overnight stay without our luggage. After a few phone calls and pleading conversations with the ground staff, we were happily reunited with our bags later that afternoon. The following day we were back at the airport for our Garuda flight to Jakarta. Checking in was a bit chaotic and not a premium experience. The check-in area was very busy and we were directed to the wrong queue even though it was signed as the Sky Priority line. We were then stopped from going into the business class check in area by a surly KLM ground staff member who physically stood in front of us so we couldn’t proceed to check in. 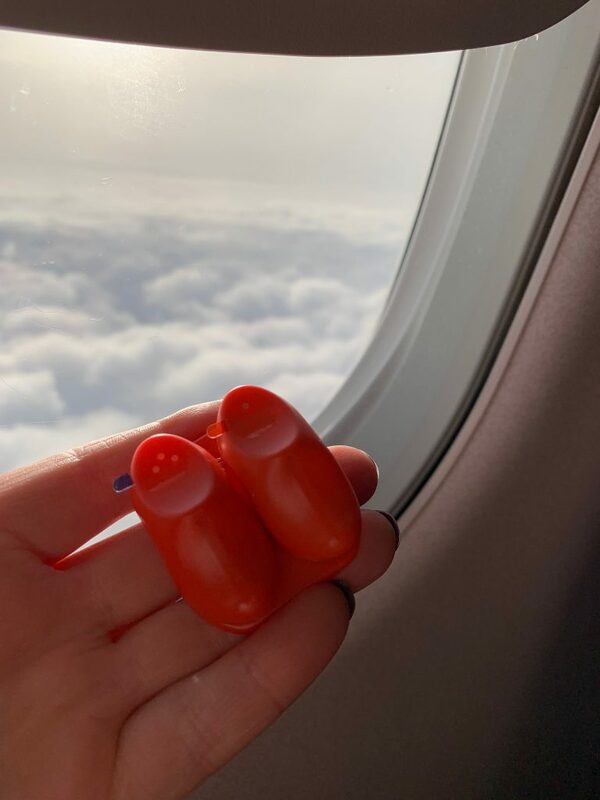 She was highly embarrassed when she realised that we were business class customers. Thankfully this was the only time we encountered bad service from KLM staff. Once through security, we headed towards the KLM Crowne Lounge which was huge, busy and not especially relaxing. There were two large food and drink sections serving breakfast and they had a good selection and choice including a wide variety of drinks. Food was replenished regularly. The lounge was very open and noisy plus the toilets weren’t particularly clean either. Our flight to Jakarta was on time and we boarded the flight via the Sky Priority line without any queuing. I was looking forward to the flight, given our two very early morning starts and a long day walking around Amsterdam the previous day. We were greeted by a smiling and friendly flight attendant (FA) and shown to our seats, 8E and 8F. 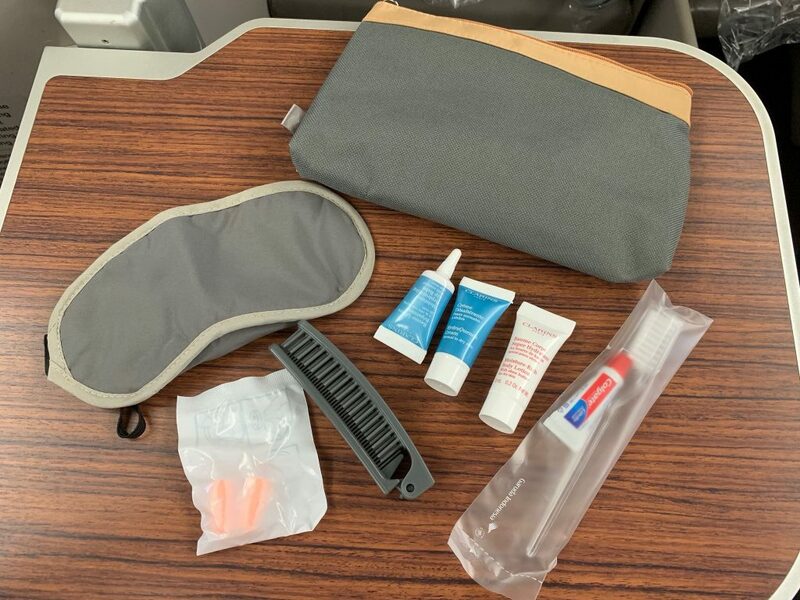 On each seat was a pillow, blanket, headphones, bottle of water and a Clarins amenity kit. We felt like the holiday was just beginning as we relaxed with a chilled glass of champagne. The FA was quite happy to bring us one of Garuda’s signature cocktails as well which was very refreshing. But drinks were never topped up, you had to request if you wanted any more or if you wanted to try dessert wine or spirits. The food was top notch, beautifully arranged/presented and absolutely delicious. Starters were served on a tray, followed by the main course, which was cleared before serving the dessert. We really enjoyed our meals on this flight. There were also several snack options if you felt hungry in between meals. 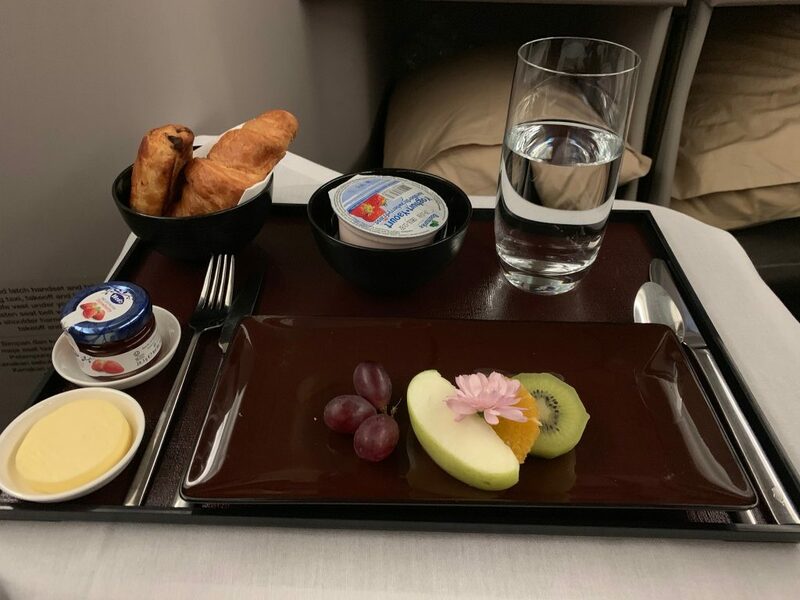 Prior to landing in Jakarta, we were served breakfast. This again was well presented. I went for the Indonesian option, a rice-based dish decorated with a Harry Potteresque style hat. The chilli certainly woke me up! The flight was almost full but the cabin didn’t feel busy. The cabin layout was 1-2-1 and on our return flight we tried the window seats which gave us plenty of room and lovely views out of the window. The seats were comfortable although there wasn’t much storage for your personal possessions apart from the overhead bins. I would have personally preferred a smaller pillow to use when I was sitting upright to give my lower back some support but a bigger pillow was great for sleeping. The massage option was subtle and the chairs reclined in a variety of positions so you could watch a film in a half reclined position. The toilets were immaculate with Clarins products available. The film selection was adequate and we both watched a couple of fairly new movie releases. 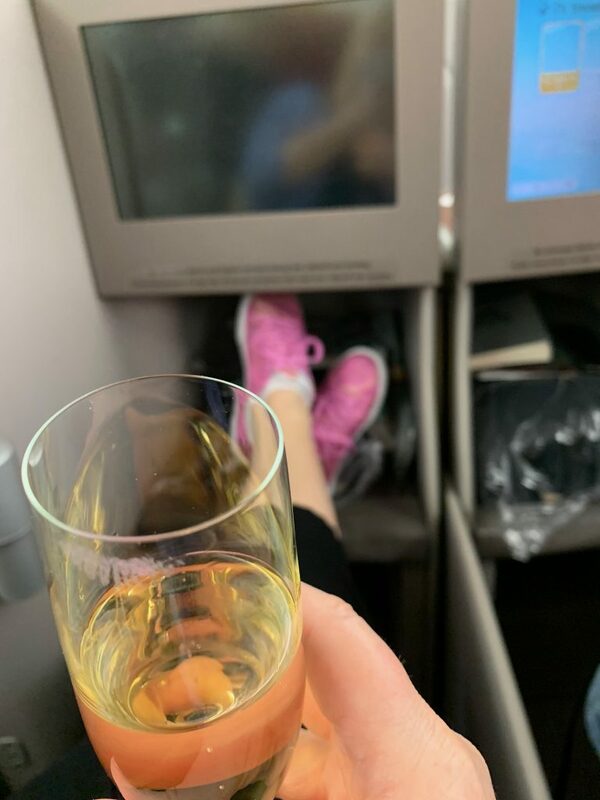 Our holiday had come after a long, busy period of work so the last thing we wanted to do was check in online or read any emails so we were more than happy to turn off our phones and laptops and forget about staying connected to anyone! We had decided to break our journey in Jakarta at the Mandarin Oriental. (review to follow) The following day we were whisked back to Soekarno-Hatta international, a modern and ever-expanding airport. We were dropped off at the Garuda area for Business and First class passengers. 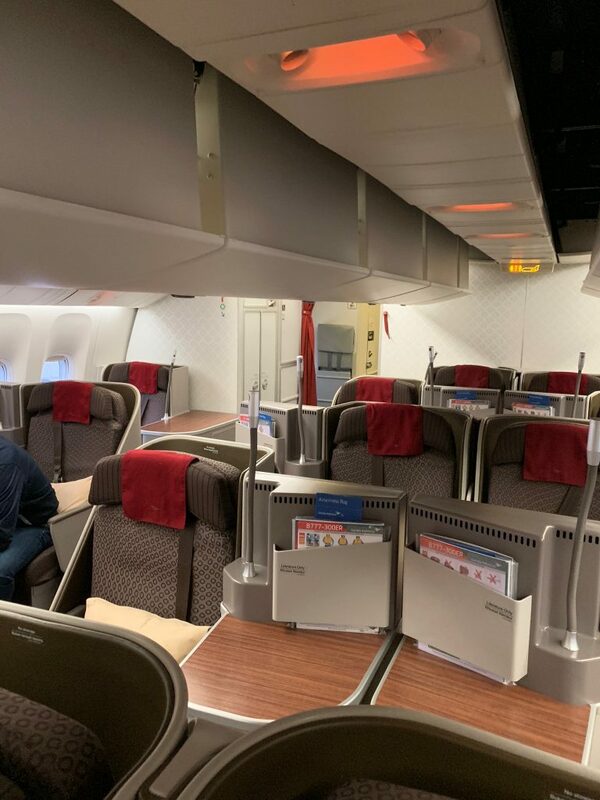 Just inside was a large Garuda dedicated business class check in section which was carpeted and with a small seating area by the multiple desks. We were greeted by one of the ground staff and shown to a check in desk where were handed our boarding passes. The area felt very premium. When we were going through fast track security, we were accompanied by one of the ground staff who personally got our passports stamped while we sat down to wait! 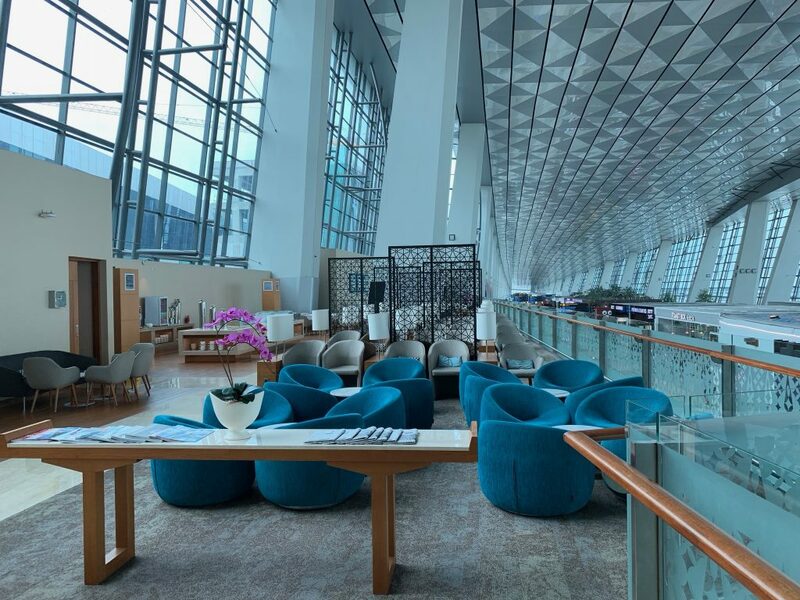 The Garuda Business lounge is a long lounge which overlooks the concourse below. Some of it is open and therefore gets quite noisy and warm. I didn’t see any alcoholic beverages on display but there was a bar (no barman) and plenty of cold drinks. My partner did have a beer on the return journey so presumably, you had to ask for alcohol. The food on offer was mainly Indonesian, sandwiches and fruit. Again, on our return flight, it was evening time and the lounge was very busy but had a wider choice of food options. However, if you were after Western food, you’d be stuck, unless you wanted toast! Our flight over to Bangkok took around 3 1/2 hours and although the seat looked a bit dated, it was extremely comfortable. We were offered a drink from a friendly and polite FA and we opted for champagne. 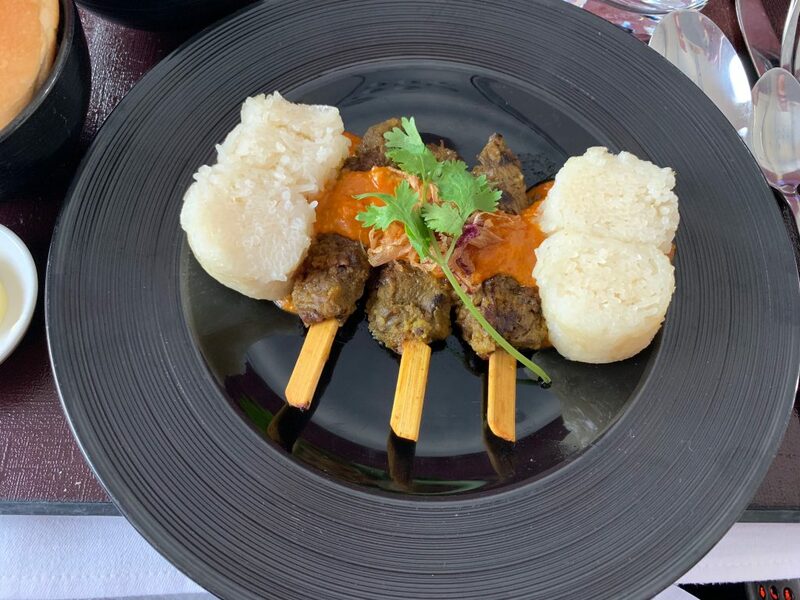 They served a 3 course lunch and while there was no choice of starter or dessert, there was a menu to select your main course. It was nicely presented with the same selection of wines as on our long haul flight. We saw a lot of airport business lounges on this trip! On our return flight, we were able to visit the Air France Lounge at Bangkok airport which was my favourite. It was quiet and peaceful with private seating sections. Typically French, there was plenty of wine and alcohol to choose from and the food was pretty good too. Lots of variety for hot dishes and a delicious array of French cakes and pastries which we just had to sample. Well, it would be rude not to! 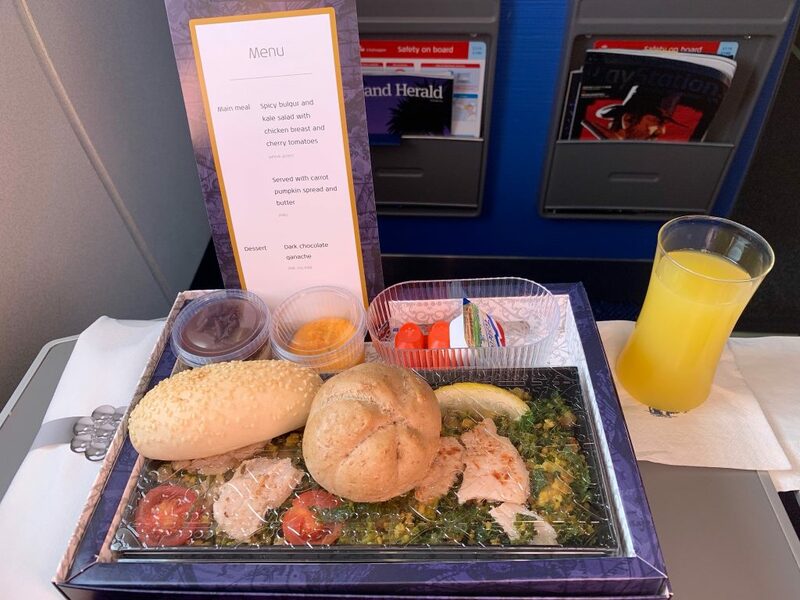 The return flight didn’t have the same level of service as our outgoing one, perhaps because it was a night flight and the FA’s spent most of the latter part of the flight in the galley chatting, rather than checking on the passengers. 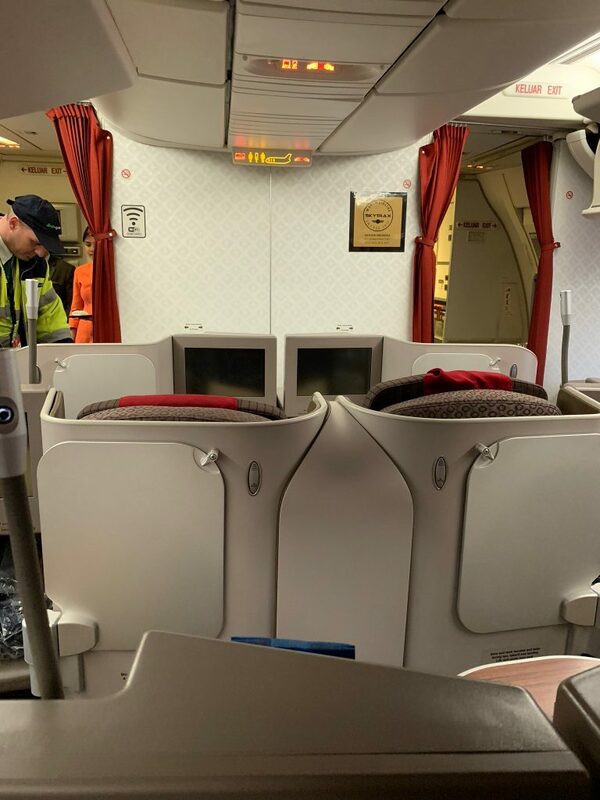 I would have expected them to go through the cabin occasionally checking on whether passengers needed a drink or snack. Orders were missed and forgotten, and they ran out of quite a few options on the menu which was a disappointment. Our breakfast orders were taken personally by the FA and written down in advance, but she still forgot our hot drinks and breakfast order. In the end we had to make do with what was left which didn’t really meet our business class expectation. Overall, I enjoyed our experience on Garuda. Breaking the journey in Jakarta on the outward part of our trip was a blessing in disguise, as we did the return journey in one go (Bangkok-Jakarta, Jakarta-Amsterdam, Amsterdam-Birmingham) and even with the comfort of business class, it was a pretty long and exhausting experience. Obviously, the original ticket had us heading back into London rather than Amsterdam, which added another leg onto the journey. The one advantage though was that due to the miles covered we immediately reached Silver status on Skyteam. However, given the overall price paid for the ticket, and if you don’t mind routing through Jakarta, if you can get a good deal on Garuda, then I’d definitely recommend them. 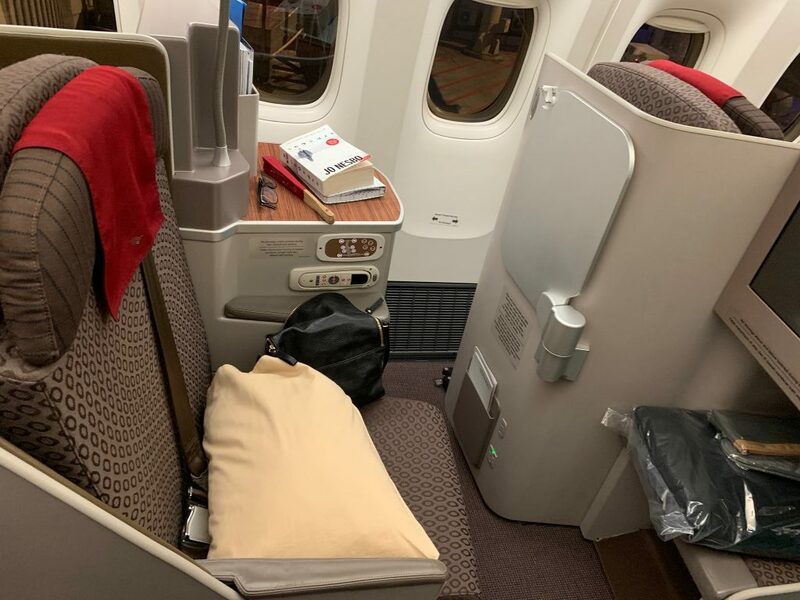 4 Comments on "Garuda Indonesia B777 business class review London to Bangkok"
An excellent review, thank you. 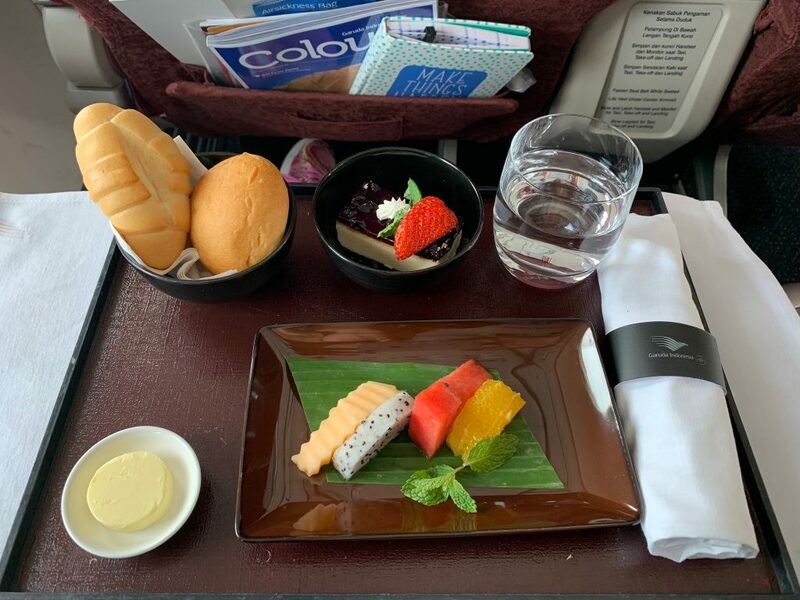 I’m flying Garuda this Thursday (18th April) direct from Heathrow to Bali in Business class, and at just over 15.5hrs, I’m keen to understand what to expect! 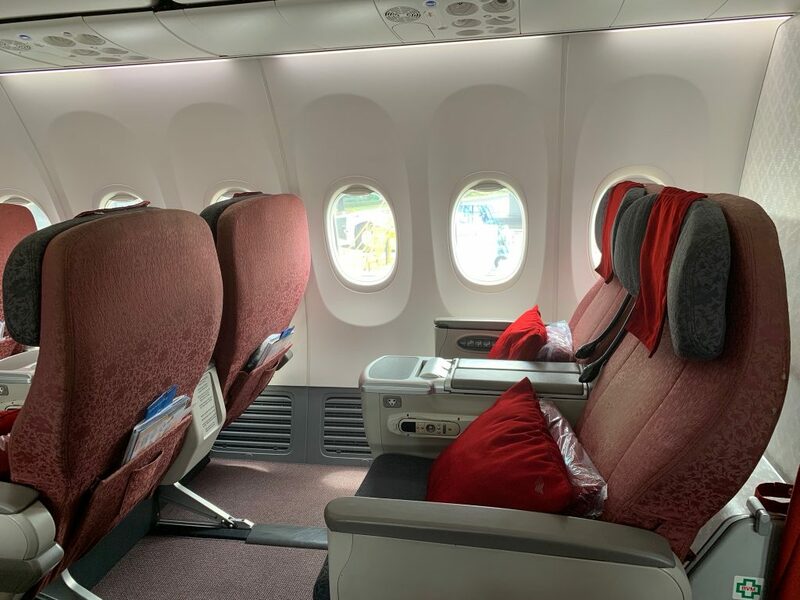 I’ve done the route to Jakarta before and at the time I felt it was just shy of the standard that Swiss Air offer on their Zurich to Bangkok route. Here’s hoping they don’t run out of meal options as per your experience! Chris. Very good review! Both in content and the way it is written. Great review. 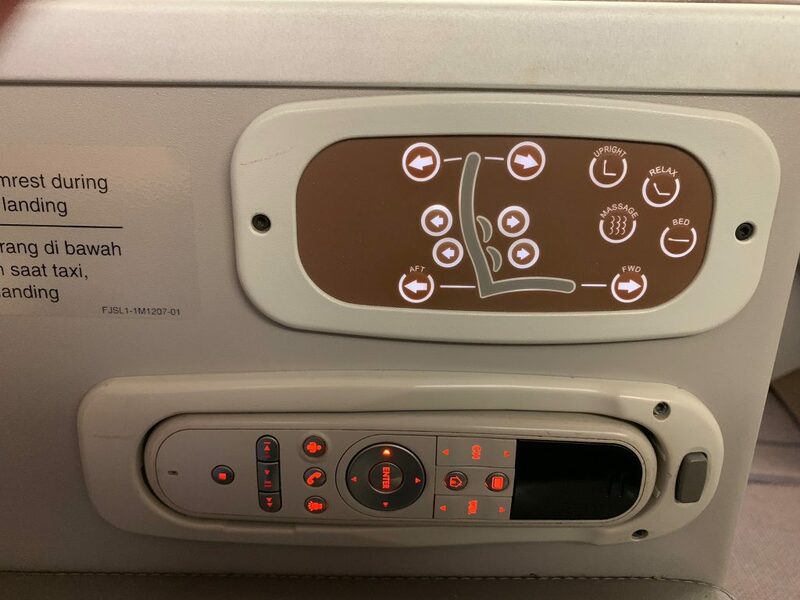 Having just flown in a 777 for 14 hours from Buenos Aires “backwards” having to step over some stranger’s legs to get out of my seat, I am jealous of Garuda’s 1-2-1 configuration and the sooner BA scraps its 2-2-2-2 layout the better.